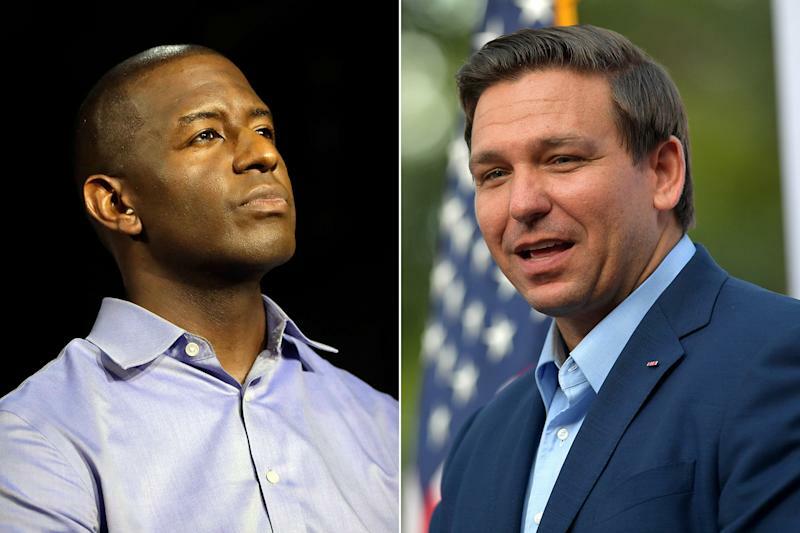 WASHINGTON — The Florida gubernatorial race isn’t over yet. On Thursday afternoon, Democrat Andrew Gillum, who conceded defeat on Tuesday night, narrowed the margin between his vote tally and that ofRepublican Ron DeSantis. As of this writing, the discrepancy sits at just over 38,000 votes out of 8.2 million cast, giving Gillum 49.15 percent of the vote to DeSantis’ 49.62 percent, according the state’s elections division. An automatic machine recount is automatically triggered under Florida law if the margin between two candidates’ share of the vote is with 0.5 percent. If the current vote tally stands or narrows further, the Gillum-DeSantis race is headed for a recount — and is far from over. If a recount does happen, it would be the first for a gubernatorial race in Florida history, according to Florida political reporter Marc Caputo, and Gillum could soon join a tiny club of politicians to have conceded a race and then withdrawn that concession. Thirty-six hours later, his campaign had changed its tune. The governor’s race isn’t the only one potentially headed into overtime. The state’s U.S. Senate contest between incumbent Democrat Bill Nelson and Republican Rick Scott, the outgoing governor, also appears headed for a recount. Indeed, the Nelson-Scott race is so tight that it could trigger a recount by hand, according to Democratic election lawyer Marc Elias. So, too, is Florida’s race for agriculture commissioner, according to the Tampa Bay Times. A similar situation is underway just one state over, in Georgia, where a razor-thin margin between Democrat Stacey Abrams and Republican Brian Kemp has prevented Abrams from formally conceding.